Used primarily as a natural organic dying agent, Alkanet root imparts a ruby red color to natural fibers, wool, wood, stone, lip balm, lipstick, ointments, salve, soap, lotion, and to tint oils, vinegar, tinctures, varnishes, and even wine. As far as organic herbs go this is one of the most sought after for its coloring property. Common alkanet originated in the Mediterranean but, the name alkanet is a derivation of the Arabic term; al khenna, "alhinna" or "henna" from the red color of the roots. This Arabic name of the plant reflects the ancient use of this plant and other related species, whose roots were and are still used as a red organic dye. Today, Alkanet (A. tinctoria) is commonly cultivated in Central and Southern Europe and sometimes Britain, for its dye, which is readily extracted by oils and alcohols. Alkanet root apparently has been used as a dye since the earliest recorded history. Theophrastus, (the Greek scholar and botanist c. 300 B.C.) made reference to alkanet in many works, and Dioscorides (77 C.E., in his "De Materia Medica",) described in great detail many of the properties of the red dyestuff. In the third and fourth centuries C.E., The Stockholm Papyrus, (or Papyrus Graecus Holmiensis) describes techniques of alkanet use as practiced Egypt. The vast detail in which the preparation of the fibers and the dyeing materials and the dyeing process itself are recorded; has led scholars to believe that it had to have been practiced for thousands of years. Alkanet leaves are also dried and used in potpourris as they give off a rich and musky fragrance similar to the smell of wild strawberry leaves before they are dried. Bark of the roots yield a weak brownish red or lilac dye and in powdered form it was traditionally used in Western Europe as rouge. The roots' red dye is fat soluble, so this plant has been used to dye ointments, oils, and waxes and is frequently used in soaps, lotions, and make up products across the world today. Well known for its pigmentation properties, dried herbs like alkanet root are largely used for dying wood and fabrics. In wood staining, alkanet is a fine imitation of rosewood, or mahogany. It is also used in varnishes for fine wood products, such as violins. Vinegar makes the root give a pinkish brown dye and the flowers give a green dye. Alum turns the roots' dye gray-green. Alkanet is a perennial or biennial herb cultivated for its delicate, unusually stunningly blue flowers that do not fade easily. The gorgeous blue scented flowers appear in late summer are a rich source of nectar and attract bees. Anchusas planted in large masses, emerge as a misty sea of deep blue when in bloom and are an invaluable bordering plant. The Dropmore Variety, (one of the most commonly grown,) achieves a height of 3 feet to 5 feet, and blooms during June and July. The blooming season can be easily lengthened by cutting down the taller sprays when the flowers begin to fade causing smaller spikes to appear which will continue blooming through September. A. myosotidiflora is a dwarf variety bearing small flowers and is used effectively in rock gardens, especially in shady alcove, where it blooms all Summer. 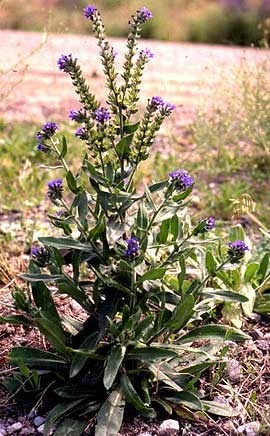 The alkanet is an invasive species and thrives in all kinds of temperate environments such as grazing pastures, alfalfa fields, pine forests, on prime rangeland, and even in waste or deserted lands. The alkanet tends to be very competitive for space, as it can grow in large and very dense stands, this gives very stiff competition to the native plant communities. Alkanet has a long history of use with many traditional herbalists and finds mention in Dr. Robert Thornton's New Family Herbal that was published in England in 1810 - it notes that "a decoction of the leaves and root of the alkanet is advantageous in inveterate coughs, and all disorders of the chest. ...the expressed juice is given with great success in pleurisy." Furthermore Dr. Thornton also speaks of the alkanet's other beneficial properties such as its "efficacy in the cure of melancholia and other hypochondriacal diseases". A cold infusion was a diuretic, and a hot one produced sweating. A homeopathic remedy for ulcers is still made from this plant. The leaves and shoots can be cooked and eaten like spinach, and the flowers cooked or used as a garnish. The tea was once a traditional remedy for melancholy, but this plant contains some alkaloids that are toxic to the liver, especially if it is used regularly. In Europe, it was assigned to the E number E103, but was banned as a food additive in 1984. In the US, it was banned in 1988.